The 'Unbreakable Runner' author Brian Mackenzie tells us why runners should lift. Brian Mackenzie is the founder of CrossFit Endurance (CFE), a protocol for improving endurance and sports training activity through the use of high intensity interval training. An endurance athlete who's ran more than 30 ultramarathons, Mackenzie and his coaches put on more than 70 seminars a year, spreading the word of injury prevention and performance improvement around the world. Check out what the Training Mask athlete has to say about running, weight lifting and the future of CFE. Muscle & Fitness: What is CrossFit Endurance? Brian Mackenzie: CrossFit Endurance is a skill-based approach to endurance training that allows people to get a better understanding for skills within running, cycling or swimming. We utilize high intensity strength and conditioning to get a better physiological adaptation to an endurance sport. There’s skill training before every endurance session and strength and conditioning session. Even though you might be doing a squat, the fact is your squatting relates to your running because your body has to understand how your hips, knees and ankles work properly. And if you’re just running, you lose that ability through constant running and not dealing with the other aspects of movement. If I’m just starting Crossfit Endurance, how many strength and conditioning/endurance days are there in a week? There are 4-6 strength and conditioning days per week. They’re 100% scaled to that person’s ability. Getting into the gym and understanding movement is the primary focus. For a beginner athlete, there are three endurance training days a week. A more intermediate athlete would do four weekly endurance sessions and an elite would have 4-6 endurance sessions a week. There are eight-week, nine-week, 10-week and 12-week programs. What are the benefits of weight lifting for running? When we run, we work in a shortened range of motion for a long period of time. We get beat up when we run because of the eccentric loading and breaking down of tissue. An absence of training in functional movement patterns leads to limited hamstring range of motion, which is one of the core reasons why you can’t run faster. It’s because you just don’t have the range of motion to be able to go that fast. Strengthening that tissue through strength and conditioning actually provides better range of motion. What age group do you direct your injury prevention advice towards? I have high school kids that come see me because they’re so busted from running five-mile runs every day of the week. A parent is just like, "What do I do?" We need to get coaches more conscious of what it means to run. You can’t just go out and heel strike. You can’t go out and just try and push off as hard as you can. That’s not what efficiency is. We need to re-train the thinking and as long as they give my methods time, they end up having better performance. What advice do you have for people training for their first running event? Kelly Starrett just wrote a book called Ready to Run and it gives people 12 things that they should be able to do prior to starting a running program. Combine these 12 things with the six-week learning process of how to run properly in my book. Then, start an actual program that would start to increase the intensity/volume of the strength and conditioning and running. 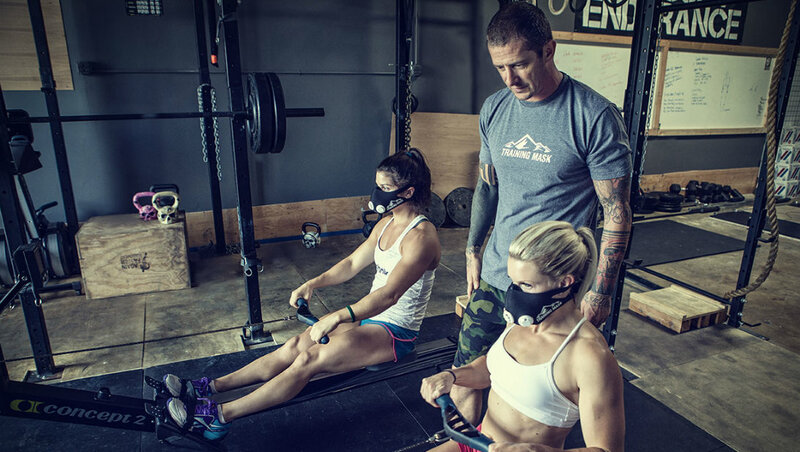 What benefits do you see from using the Training Mask? The Training Mask has provided the best respiratory warm up that I’ve ever had. The biggest change we’ve seen from using the Training Mask with our athletes is that it teaches you how to use your diaphragm rather quickly. I can do the intervals in the workout below wearing the Training Mask during the rest periods. But, when I didn’t use the Training Mask during active recovery, it was harder for me to recover because I was hyperventilating and not using my diaphragm and taking in big, deep breaths. How many times per week should I use the Training Mask? You can use it every day during warmups. During recovery periods within interval workouts, two to three times a week. You still want to be able to get back to not having the mask so you know how you’re performing. In three weeks you should start to see a change. What does the future hold for Crossfit Endurance? We’ve got a great group of coaches and a lot of my training has morphed more into sport-specific work. I’ve got professional athletes such as baseball players, football players and surfers. I see the ability to use CrossFit as a screening tool for an athlete and when I can expose something that an athlete does poorly, I know that will inevitably end up showing up at some point in their sport-specific work. The goal is to get that problem fixed in the first place. We need to be fit, but we also need to be able to move in our later years. The movement piece is what’s been missing, and that’s what our mission is. Active Rest: 1 minute with Training Mask on.